Pulled pork is synonymous with barbecue in many parts of the country. The tender meat and tangy flavor is a staple at family reunions and parties of all sizes. When you're serving food to a sizable group of 30 to 40 people, you'll want to crunch your numbers carefully to make sure you've bought enough meat for everyone. The basic rule of thumb for catering and feeding large groups varies depending on the meal time. Generally, allow four to five ounces of boneless meat for each guest at lunch. Plan for a bit more meat, about five to seven ounces, if you're serving dinner to your crowd. For a party of 30 to 40 people, this works out to be nine to 12 pounds of pulled pork for lunch, and 13 to 17 pounds for dinner. Sometimes it's not so much about how much food you need, but how you plan to serve it, that helps you decide how much to buy. A plated dinner, for example, is easier to plan for because you'll know exactly how many plates to prepare, assuming all of your guests have RSVP'ed to your invitation. In this case, have one or two additional servings ready in case your numbers are off. A buffet can be harder to judge because guests can take as much food as they like. You might err on the side of caution, for example, and allocate five to seven ounces of pulled pork per person during a lunch buffet to ensure you don't run out of food. If you're serving ready-made pulled pork sandwiches, allow one or two sandwiches per person, depending on the size. Selecting a number of hearty side dishes can cut back a bit on the amount of pulled pork you'll need to serve a big group of people. Calculate the side dishes in portions of four ounces per person to provide variety and satisfy everyone's appetite. Choose accompaniments that complement the barbecue theme, such as corn on the cob, salad or other greens and baked beans. If you're not serving the pork in pre-assembled sandwich form, a basket of rolls -- one to two per person -- rounds out the meal. Pulled pork is easy to freeze in the event that you've overbought. Spoon the meat, with plenty of sauce, into airtight containers. 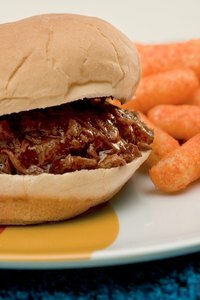 Pulled pork sandwiches tend to get soggy in the freezer; remove the bread and just freeze the meat. Let the pork cool before closing the container. Frozen pulled pork keeps for four to six months.